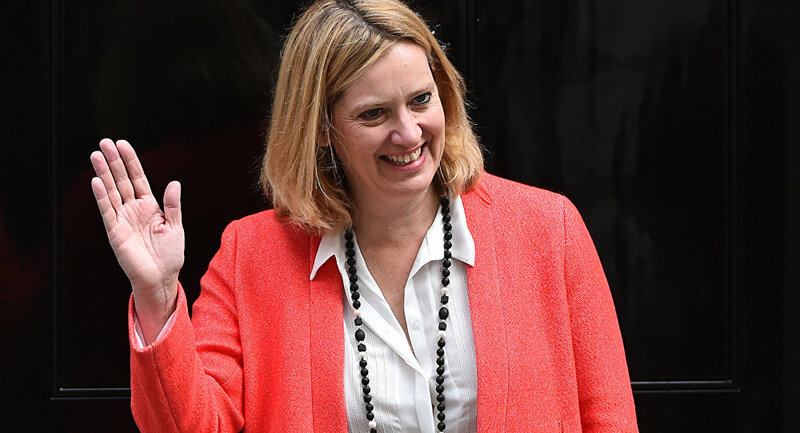 The under-fire Home Secretary, Amber Rudd, is reportedly planning to quit her marginal constituency in Hastings and take on a safe seat in Mid-Sussex. But when Sputnik approached veteran Conservative MP Sir Nicholas Soames he replied with an earthy riposte. Sir Nicholas, who is the grandson of Winston Churchill, has been an MP since 1983 and is something of a character. During last year's general election he campaigned on the back of a horse. Sputnik approached the 70-year-old's parliamentary assistant Claire Barker to ask for his reaction to suggestions, which originally emerged last year, that Ms. Rudd might give up her seat in Hastings — where she had a majority of only 346 last year — and be selected for his seat if, as expected, he retires. "I have spoken to Sir Nicholas and his reply to you is 'Balls'," Ms. Barker emailed Sputnik on Tuesday, April 17. Sir Nicholas has a majority of almost 20,000 in Mid-Sussex, an affluent and largely rural swathe of southern England, which includes the small towns of Burgess Hill and Haywards Heath. Ms. Rudd came within a whisker of losing her seat at Hastings & Rye in June last year. She had 25,668 votes, only fractionally ahead of Labour's Peter Chowney, a local councillor, who had 25,322. "I'm just hopeful, but not complacent," she told an interviewer just before the result, amid reports that she had actually lost the seat to Mr. Chowney. Despite her bungling — the latest of which was the revelations on Monday, April 16, that members of the "Windrush generation" of immigrants from the Caribbean have been deported, Ms. Rudd remains highly thought of in the Conservative Party and has even been talked of as a possible successor to Theresa May. But Labour can be sure to throw everything at Hastings at the next election in the hope of unseating her, so she is believed to be looking at a safer seat, such as Sir Nicholas's. This tactic is common in British politics and is known as a "chicken run". Ironically Sir Nicholas himself carried out a chicken run in 1997, when he switched from the marginal seat of Crawley to Mid-Sussex. It was a wise choice because Crawley went over to Labour in the 1997 landslide election. Hugh Smyth, a banker who was born and brought up in the Mid-Sussex constituency, told Sputnik he thought it was "cynical but understandable" if Ms. Rudd switched constituencies. "She held on by the skin of her teeth in Hastings and I wouldn't be surprised if the seat goes to Labour in the next election," Mr. Smyth told Sputnik. He said people in Hastings were concerned that crime had been rising in the town, partly as a result of the police cuts which Ms. Rudd has overseen. "People don't realise how deprived Hastings is and the continued squeeze in public finances seems to be having an effect there," Mr. Smyth told Sputnik. "Soames is a funny blend of the old and the new. He campaigned on the back of a horse at the last election but he is all over Twitter. He is generally considered to be a nice guy," Mr. Smyth told Sputnik. "Mid Sussex is a strangely safe seat. The council has only one councillor who is not a Conservative. That could change in the future though as Burgess Hill expands because the town has got more of a red tint than the rest of Mid Sussex," he told Sputnik.